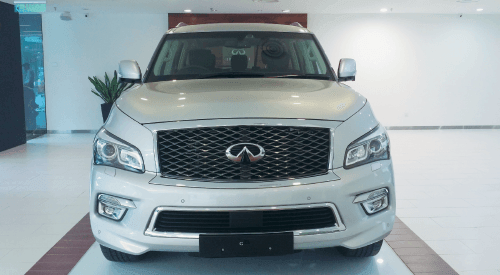 FOR 2015, the colossal Infiniti QX80 SUV gets new front-end styling, with Infiniti signature-styled light-emitting diodes for headlamps, turn signals and fog lights. There’s a new bumper design with flush sonar sensors, and side-mirrors get chrome plating on top of a double arch mesh wave pattern grille. Inside, the QX80 is a spacious beast, with a high seating position and big front chairs that don’t lack for room in any direction except where knees meet the centre console. Its large seats come wrapped in soft leather (semi-aniline) with multizone Plasmacluster air-conditioning and curtain air vents as well as a BOSE 5.1 cabin surround rear entertainment system. Seating is enough for eight occupants. The Infiniti QX80 SUV gets a 5.6-litre (405hp) engine with all-mode 4WD and hydraulic body motion control as well as a top of range Infiniti safety shield full suite such as the predictive forward collision warning, around-view monitor with back-up collision intervention, to name a few. Mated to 7-speed automatic transmission, the near 2.8-tonne beast has a wheelbase longer than a SWB W222 S-Class. It makes the Audi Q7, as well as Lexus LX, Range Rover and Mercedes-Benz GL look small. It is absolutely massive in terms of physical size. No price has been advised but to give you an idea the Mercedes-Benz GL 500 (4.6 V8) goes for RM913,000 while the Range Rover 5.0 V8 Supercharged breaks the million dollar mark at RM1,089,888. The Infiniti Center Kuala Lumpur is located at The ICON, West Wing, No 1, Jalan 1/68F, Jalan Tun Razak, 55000 Kuala Lumpur, Malaysia. For enquiries call Infiniti at (016) 6687501.